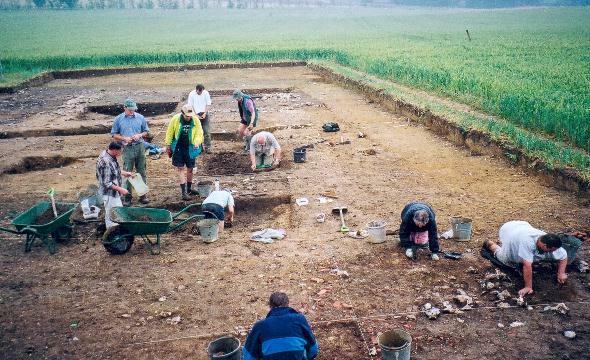 During June the BHAS Field Unit received a request from the Mid Sussex Field Archaeological Team to assist them in their major excavation of a Roman villa close to Barcombe church. The area under excavation for this season is the northern section of an 'L' shaped complex, both the remaining wing and possible bath house locations will be the subject of further investigation in future seasons (see photo). The site is already providing evidence for several phases of development with post holes indicating an early timber framed structure. Despite the site being ravaged by metal detectorists over the past few years, finds of coins and brooches have been made. Other finds have included impressive pieces of decorated Samian ware, fine wares, glass vessels and bone pins. Several members of the Field Unit have attended the training courses organised by University College, London. Clive Langan and Liza Stewart, on one such course, found a coin of Constantine II during a metal detecting training session, close to the location of one of the bath-houses. BRAS will continue to assist with the excavation until their season closes. The season at Rocky Clump began in late May and produced evidence for a new wall parallel to the one found at the end of the 2000 season. The new wall is spaced 3 metres apart from, and to the east, of the one found previously. The southern section of this new building possesses a new section of flint cobbled flooring which has sunk into the previously known ditch running north to south (see photos). The areas are being recorded prior to removing the upper contexts, to enable investigation of the lower stratigraphy of the north/south ditch section. The excavation stopped when the team moved to Barcombe, but will begin again in late August and continue until weather prevents further work. The Young Archaeologists' Club will be joining the team in September, for a training session on archaeological excavation. A small number of the Unit conducted a geophysical survey in the gardens and paddock to the south of New Place, Pulborough. The garden wall of New Place contains some buttresses of considerable size, suggesting that they may be features other than a garden wall. The results of the survey do indeed suggest that the buttresses may be the remaining vestiges of a building that was once attached to the existing building, but only excavation can provide evidence for such a structure. Other areas of high resistance also suggest the remains of earlier structures on the east side of the existing building. 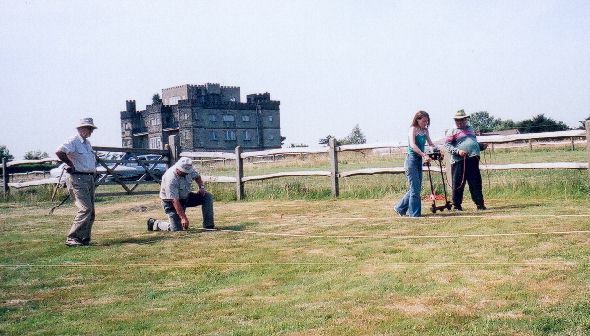 The Field Unit conducted a geophysical survey of land close to Beedings 'Castle', Nutbourne in July. Some time ago, during a small excavation carried out by Con Ainsworth, a number of prehistoric pottery and flint artefacts were found associated with a ditch in this area; unfortunately the exact position of this ditch has since been lost. As development is planned for this area the resistivity survey was carried out to locate this feature in advance of building work . The results of the survey provided little evidence for archaeological features but suggested only geological anomalies. A watching brief is being arranged to examine the ground after top soil removal. The project was undertaken at the request of, and directed by, Caroline Wells. The Unit were asked by Chichester Archaeology Society to conduct a resistivity survey at houses north of Chichester in an attempt to locate a Roman road running north from the ancient town. 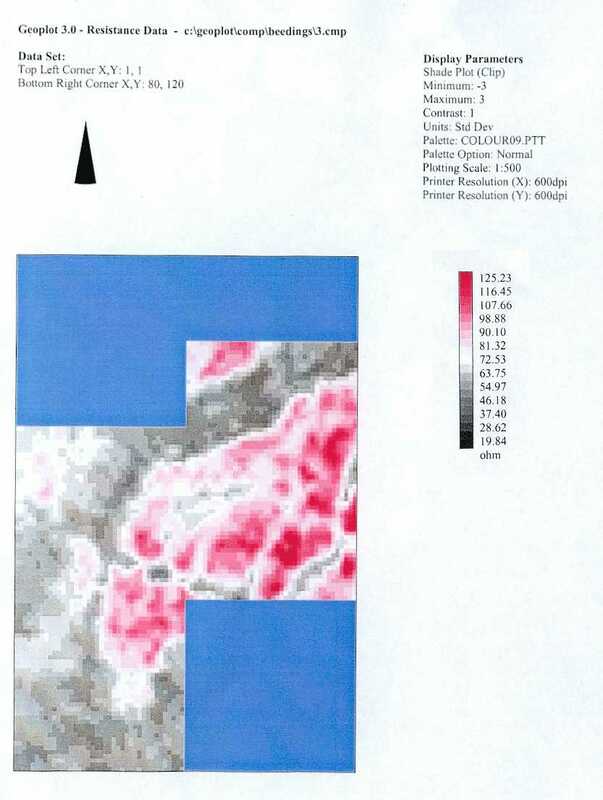 The survey was conducted in two gardens and whilst the results provided sequences of extremely high readings, as would be expected from a compacted stone feature, the lack of consistency in the direction of the readings tends to suggest that they are not the road. It is of course possible that the road has been 'robbed' of some of the material, but only excavation can really confirm whether the road does lie beneath the gardens. The results provided little evidence of flanking drainage ditches although dowsing in the same gardens seemed to suggest their presence. A watching brief at Roedean Crescent provided a number of sherds of Roman pottery as well as an even more impressive feature; a large subterranean void was found to the north of the building under renovation. This newly found feature measured 3 metres square and consisted of a single room with a number of cupboards or store rooms; leading off this room were three passages - to the north, the west and east . The passages to the west and east ended in a series of iron rungs which led up to trap doors now sealed by concrete cappings. An air filtration unit was still in place and has been photographed. Bill Santer of the BHAS Field Unit and Ron Martin of the Industrial Archaeology Group have been making further investigations. The chamber may be associated with the Royal Navy when it was located at Roedean School. Investigations will continue. A watching brief, conducted by Bill Santer, at a house in Saunders Hill, Coldean, produced finds of flint work, Roman pottery and fire-cracked flint. A note has been made and will be forwarded to the County Archaeologist. The BHAS Field Unit assisted SEAS in their excavation at Angmering, West Sussex. The site contained a number of large Iron Age pits, Roman rectangular buildings and a beautifully preserved flint constructed corn drying oven. Unit members John Funnell, Liza Stewart and Gary Bishop went flying around Sussex in early August taking aerial photographs of Rocky Clump and Barcombe. Photographs were also taken of Ditchling Beacon, Caburn, Devils Dyke, Cissbury and Chanctonbury. Liza Stewart was the pilot of the aeroplane, her first time at the controls. The autumn and winter months will be very active for the Unit, field walking, geophysics and surveying are planned for this period. Other pursuits will include finds processing, day schools and trips to archaeological venues. Many of these projects will be announced at the lectures. We are sorry to announce the recent deaths of David Combes, our Honorary Member, and Con Ainsworth.